Ten Earths could easily fit in the "claw" of this seemingly solar monster. The monster, actually a huge eruptive prominence, is seen moving out from our Sun in this condensed half-hour time-lapse sequence. This large prominence, though, is significant not only for its size, but its shape. The twisted figure eight shape indicates that a complex magnetic field threads through the emerging solar particles. Differential rotation of gas just inside the surface of the Sun might help account for the surface explosion. The five frame sequence was taken in early 2000 by the Sun-orbiting SOHO satellite. Although large prominences and energetic Coronal Mass Ejections (CMEs) are relatively rare, they are again occurring more frequently now that we are near the Solar Maximum, a time of peak sunspot and solar activity in the eleven-year solar cycle. Image Credit: NASA/JPL-Caltech/Cornell/Arizona State U. On January 25 (UT) 2004, the Opportunity rover fell to Mars, making today the 10th anniversary of its landing. After more than 3,500 sols (Mars solar days) the golf cart-sized robot from Earth is still actively exploring the Red Planet, though its original mission plan was for three months. 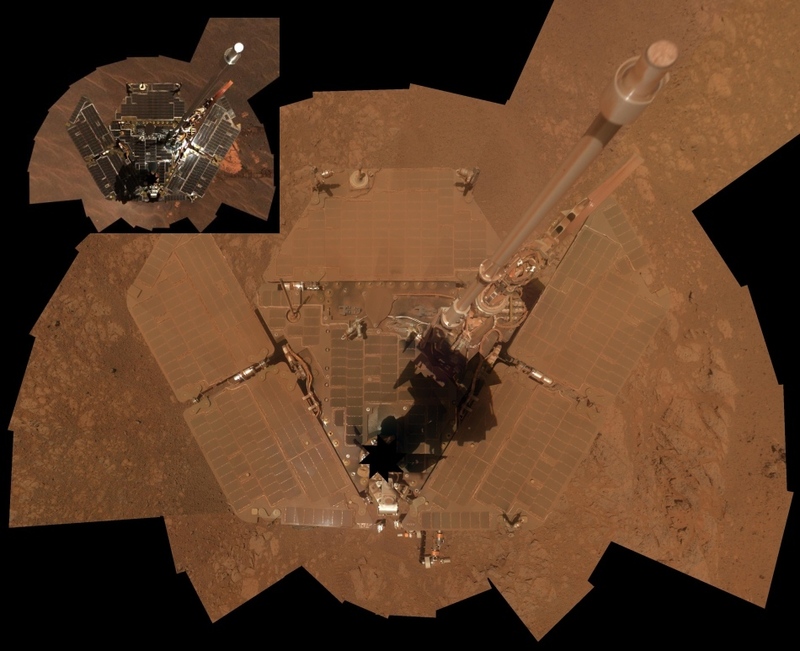 This self-portrait was made with Opportunity's panoramic camera earlier this month. The camera's supporting mast has been edited out of the image mosaic but its shadow is visible on the dusty solar panels arrayed across the rover's deck. For comparison, a similar self-portrait from late 2004 is shown in the inset. Having driven some 39 kilometers (24 miles) from its landing site, Opportunity now rests at Solander Point at the rim of Endeavour Crater. On January 25 (UT) 2004, the Opportunity rover fell to Mars, making today the 9th anniversary of its landing. After more than 3,200 sols (Mars solar days) the golf cart-sized robot from Earth is still actively exploring the Red Planet, though its original mission plan was for three months. Having driven some 35 kilometers (22 miles) from its landing site, Opportunity's panoramic camera recorded the segments of this scene, in November and December of last year. The digitally stitched panorama spans more than 210 degrees across the Matijevic Hill area along the western rim of Endeavour Crater. Features dubbed Copper Cliff, a dark outcrop, appear at the left, and Whitewater Lake, a bright outcrop, at the far right. The image is presented here in a natural color approximation of what the scene would look like to human eyes. Where on Mars should you spend the winter? As winter approached in the southern hemisphere of Mars last November, the Opportunity rover had just this problem -- it needed a place to go. The reduced amount of sunlight impacting Opportunity's solar panels combined with the extra power needed to keep equipment warm could drain Opportunity's batteries. 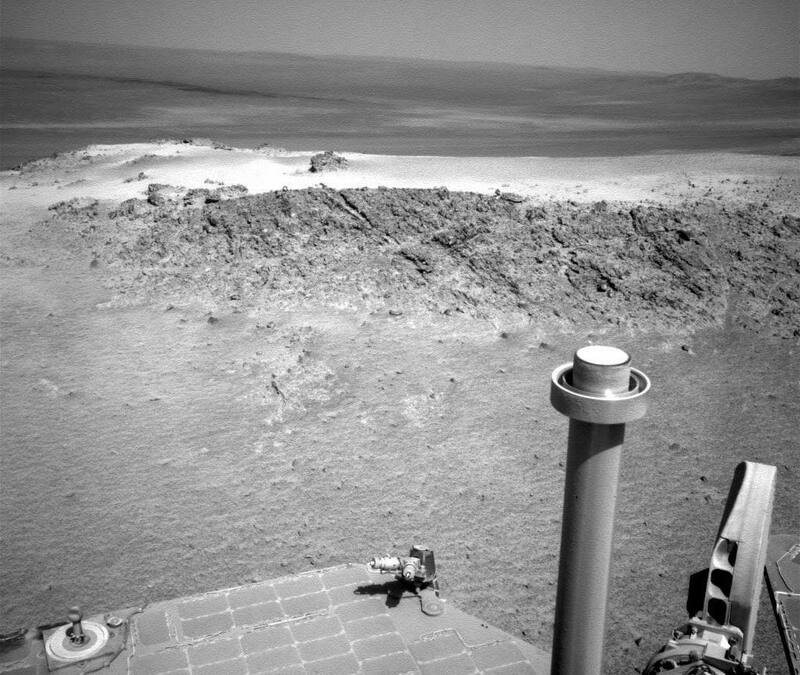 Therefore Opportunity was instructed to climb onto the 15 degree incline of Greeley's Haven, shown as the rocky slope ahead. The incline increased power input as Opportunity's solar panels now have greater exposure to sunlight, while also giving the rolling robot some interesting landscape to explore. Visible in the distance, beyond Greeley Haven, lies expansive Endeavour Crater, the ancient impact basin that Opportunity will continue exploring as the Martian winter concludes in a few months, if it survives. 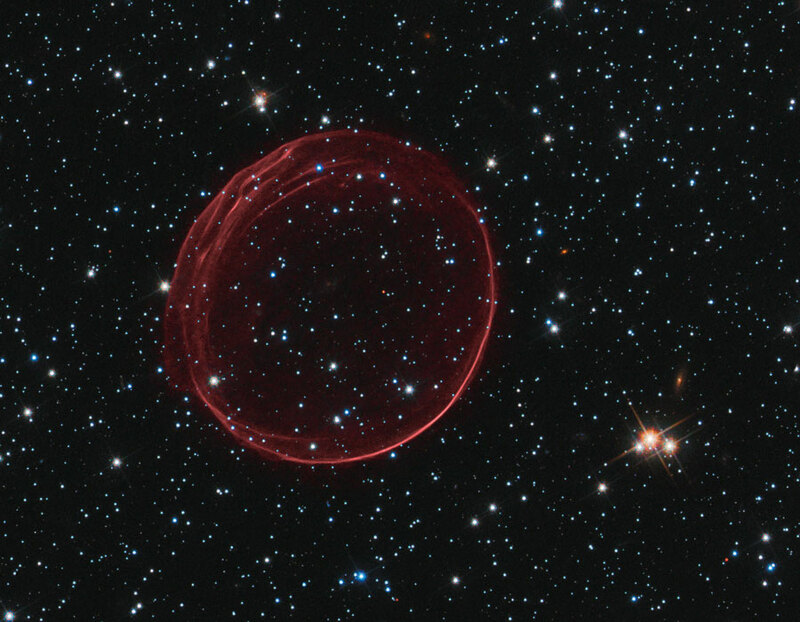 What is causing the picturesque ripples of supernova remnant SNR 0509-67.5? The ripples, as well as the greater nebula, were imaged in unprecedented detail by the Hubble Space Telescope in 2006 and again late last year. The red color was recoded by a Hubble filter that left only the light emitted by energetic hydrogen. The precise reason for the ripples remains unknown, with two considered origin hypotheses relating them to relatively dense portions of either ejected or impacted gas. The reason for the broader red glowing ring is more clear, with expansion speed and light echos relating it to a classic Type Ia supernova explosion that must have occurred about 400 years earlier. SNR 0509 currently spans about 23 light years and lies about 160,000 light years away toward the constellation of the dolphinfish (Dorado) in the Large Magellanic Cloud. The expanding ring carries with it another great mystery, however: why wasn't this supernova seen 400 years ago when light from the initial blast should have passed the Earth? Credit: David L. Nidever et al., NRAO/AUI/NSF & A. Mellinger, LAB Survey, Parkes Obs., Westerbork Obs., Arecibo Obs. Spanning the sky toward the majestic Clouds of Magellan is an unusual stream of gas: the Magellanic Stream. The origin of this gas remains unknown but likely holds a clue to the origin and fate of our Milky Way's most famous satellite galaxies: the LMC and the SMC. Until recently, two leading genesis hypotheses have been considered: that the stream was created by gas stripped off these galaxies as they passed through the halo of our Milky Way, or that the stream was created by the differential gravitational tug of the Milky Way. Recently, however, wide angle radio images -- including those from the Byrd Green Bank Telescope -- have shown that the Magellanic Stream is longer and older than previously thought, perhaps as old as 2.5 billion years. These observations bolster a third possible origin for the stream -- that the Large and Small Magellanic Cloud galaxies once passed so close to each other that gravitational tides triggered a burst of star formation that left the stream. 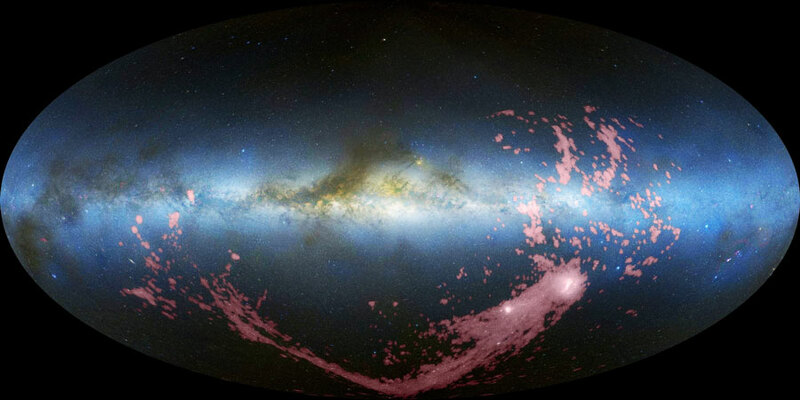 Pictured above digitally superposed on a recently-completed all-sky image in visible light, the radio emission of Magellanic stream is shown in false color pink extending across the sky and ending at the two Magellanic galaxies on the lower right. Tomorrow, a few lucky people may see a "ring of fire." That's a name for the central view of an annular eclipse of the Sun by the Moon. At the peak of this eclipse, the middle of the Sun will appear to be missing and the dark Moon will appear to be surrounded by the bright Sun. This will only be visible, however, from a path that crosses the southern Indian Ocean. From more populated locations, southern Africa and parts of Australia, most of the Moon will only appear to take a bite out the Sun. Remember to never look directly at the Sun even during an eclipse. An annular eclipse occurs instead of a total eclipse when the Moon is on the far part of its elliptical orbit around the Earth. The next annular eclipse of the Sun will take place in 2010 January, although a total solar eclipse will occur this July. 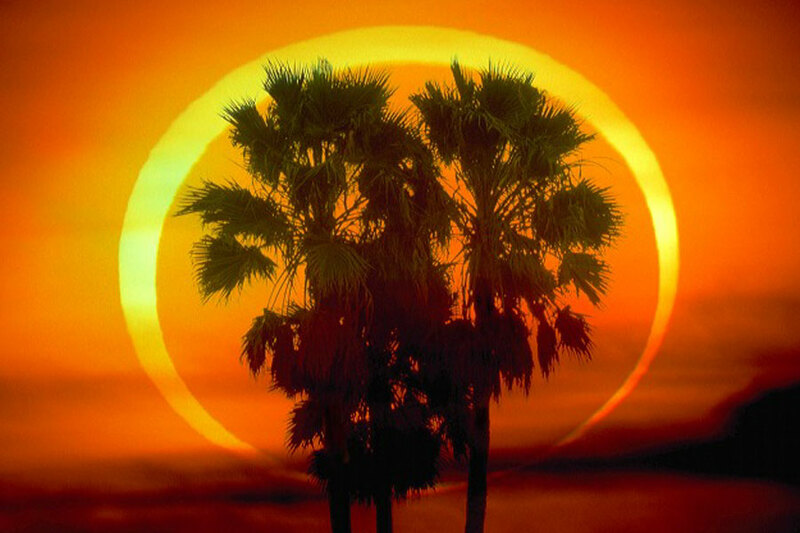 Pictured above, a spectacular annular eclipse was photographed behind palm trees on 1992 January. 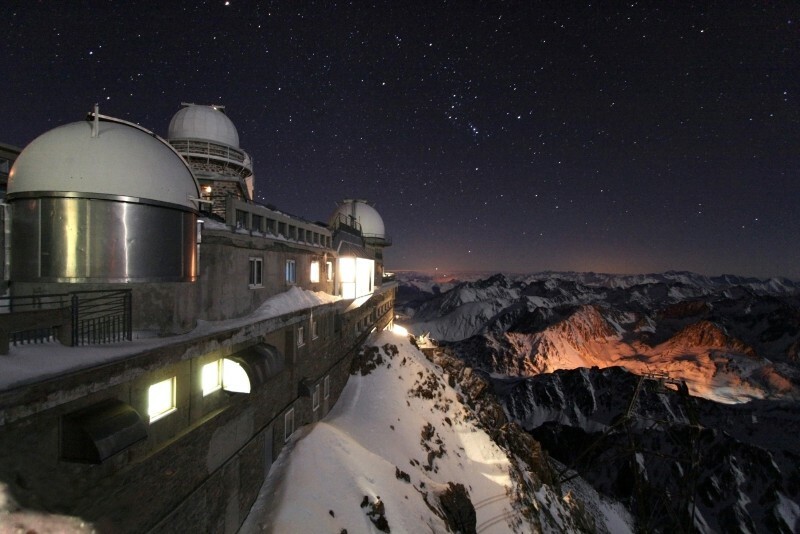 This dreamlike view looking south from the historic mountain top Pic du Midi Observatory combines moonlit domes, a winter night sky, and the snowy peaks of the French Pyrenees. Encroaching on the night, lights from the La Mongie ski resort illuminate the mountain slopes nearby while the glow along the distant horizon is from urban areas in southern France and Spain. The night sky features stars of the constellations Orion and Gemini with a bright planet Mars very near the top edge, left of center. The three prominent domes visible (from left to right) house a 0.6 meter telescope reserved for amateur astronomers, a 1 meter telescope that was used to support the Apollo lunar landing missions, and the new, Sun-watching CLIMSO. Cradled in glowing hydrogen, stellar nurseries in Orion lie at the edge of a giant molecular cloud some 1,500 light-years away. This breath-taking view spans about 13 degrees across the center of the well-known constellation with the Great Orion Nebula, the closest large star forming region, just right of center. The deep mosaic also includes (left of center), the Horsehead Nebula, the Flame Nebula, and Orion's belt stars. Image data acquired with a hydrogen alpha filter adds other remarkable features to this wide angle cosmic vista -- pervasive tendrils of energized atomic hydrogen gas and portions of the surrounding Barnard's Loop. While the Orion Nebula and belt stars are easy to see with the unaided eye, emission from the extensive interstellar gas is faint and much harder to record, even in telescopic views of the nebula-rich complex. Why is this galaxy so active? Nearby spiral galaxy NGC 6946 is undergoing a tremendous burst of star formation with no obvious cause. 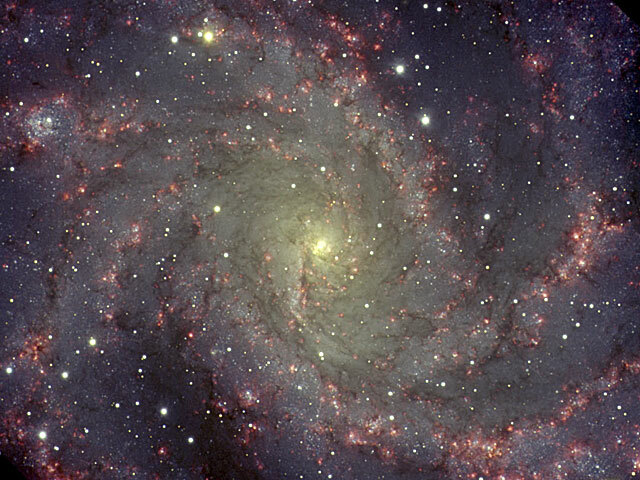 In many cases spirals light up when interacting with another galaxy, but NGC 6946 appears relatively isolated in space. Located just 10 million light years away toward the constellation of Cepheus, this beautiful face-on spiral spans about 20,000 light years and is seen through a field of foreground stars from our Milky Way Galaxy. The center of NGC 6946 is home to a nuclear starburst itself, and picturesque dark dust is seen lacing the disk along with bright blue stars, red emission nebulas, fast moving gas clouds, and unusually frequent supernovas. 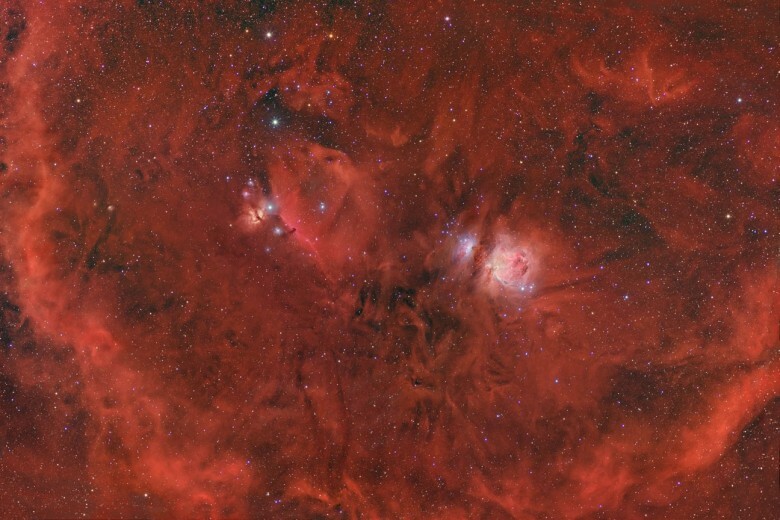 The 8-meter Gemini North Telescope in Hawaii, USA, took the above image. A suggested explanation for the high star formation rate is the recent accretion of many primordial low-mass neutral hydrogen clouds from the surrounding region. Galaxies are fascinating not only for what is visible, but for what is invisible. 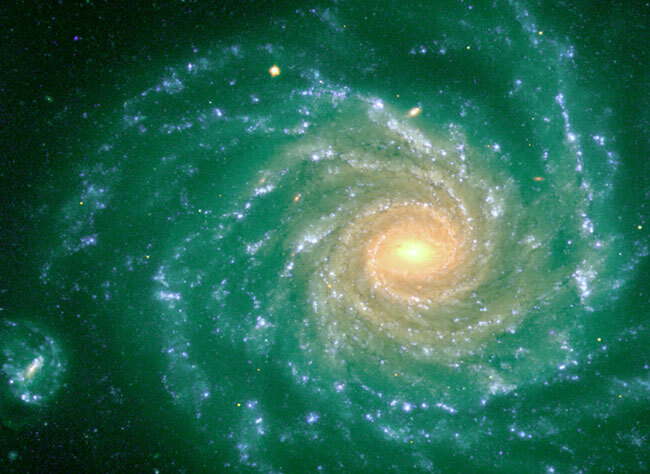 Grand spiral galaxy NGC 1232, captured in detail by one of the new Very Large Telescopes, is a good example. The visible is dominated by millions of bright stars and dark dust, caught up in a gravitational swirl of spiral arms rotating about the center. Open clusters containing bright blue stars can be seen sprinkled along these spiral arms, while dark lanes of dense interstellar dust can be seen sprinkled between them. Less visible, but detectable, are billions of dim normal stars and vast tracts of interstellar gas, together wielding such high mass that they dominate the dynamics of the inner galaxy. Invisible are even greater amounts of matter in a form we don't yet know - pervasive dark matter needed to explain the motions of the visible in the outer galaxy. What's out there? Globular star cluster Palomar 13 has roamed the halo of our Milky Way Galaxy for the last 12 billion years. The apparently sparse cluster of stars just left of center in this composite color digital image, it is one of the smallest, faintest globular clusters known. 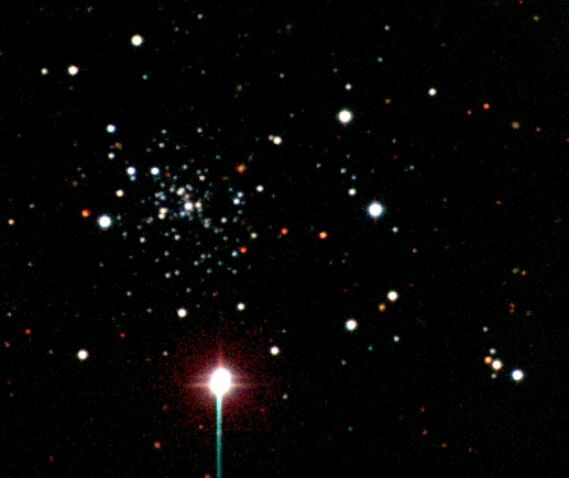 (The bright foreground star near bottom is unrelated and creates the spiky imaging artifacts.) Observations spanning forty years indicate that Palomar 13's galactic halo orbit is a highly eccentric one which, every one or two billion years, brings it relatively close to the galactic center. With each close approach to the Milky Way's central regions, gravitational tidal forces strip away the delicately bound cluster stars. In fact, detailed present day studies offer evidence for a dramatic end to this dwindling cluster's tidal tug of war. Palomar 13's latest close approach was only about 70 million years ago. But, when Palomar 13 again approaches the galaxy, it could well turn out to be the cluster's last stand. 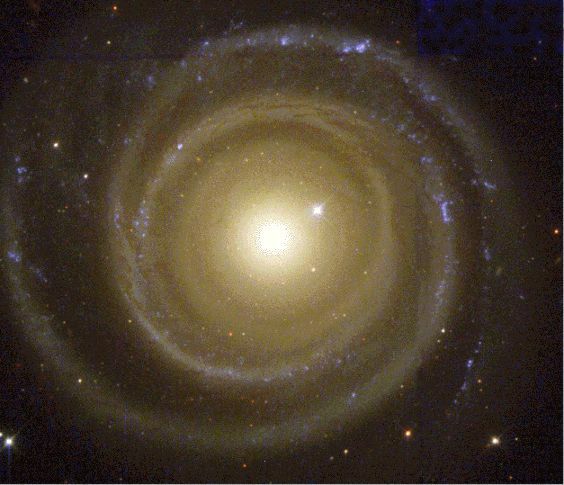 While stirring a morning cup of coffee and thinking cosmic thoughts many astronomers would glance at this Hubble Space Telescope image of spiral galaxy NGC 4622 and assume that the galaxy was rotating counterclockwise in the picture. One hundred million light-years away in the constellation Centaurus, NGC 4622's gorgeous outer spiral arms, traced by bright bluish star clusters and dark dust lanes, should be winding up like ... well, like swirls in a cup of coffee. But a closer look at this galaxy reveals that a pronounced inner spiral arm winds in the opposite direction. So which way is this galaxy rotating? Recent evidence combining ground-based spectroscopy and the sharp Hubble image data surprisingly indicates that the galaxy is likely rotating clockwise in the picture, its outer spiral arms opening outward in the direction of rotation. There are further indications that a past collision with a smaller companion galaxy has contributed to this bizarre rotational arrangement of spiral arms, essentially unique among known large spiral galaxies, in NGC 4622. Spacecraft on long interplanetary voyages often use the planets themselves as gravitational "sling shots" to boost them along their way. Launched in February of 1999 on a historic voyage to a comet, the Stardust spacecraft is no different. On 15 January 2001 Stardust made its closest approach to planet Earth since launch, coming within about 6,000 kilometers of the surface. It used this gravity assist maneuver to increase its speed and alter its trajectory toward an encounter with comet Wild 2, which it should reach in 2004. 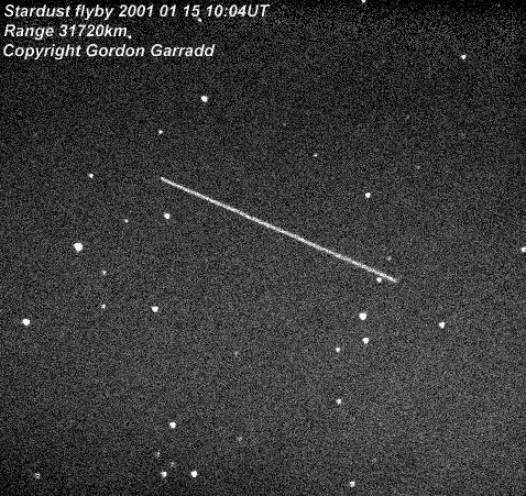 Shortly before its time of closest approach, astronomer Gordon Garradd recorded this exposure of Stardust sailing through the skies above Loomberah, Australia. Nearby and moving fast, the spacecraft appears as a streak against a background of faint stars in the constellation Cetus. Stardust cruised within just 98,000 kilometers of the Moon about 15 hours later. After collecting dust from the tail of comet Wild 2, Stardust's voyage will continue -- as it returns the samples to Earth in 2006. Our Moon turned red last week. 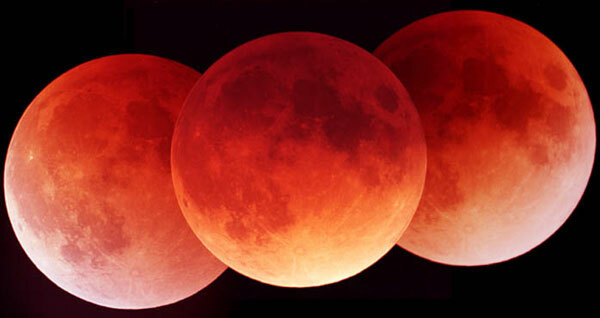 The reason was that during the night of January 20, a total lunar eclipse occurred. The above digitally superimposed photographs captured the Moon three times during this lunar eclipse, once just as the Moon entered the Earth's shadow, once when the Moon was near the middle of the shadow, and once just before the Moon exited. The red tint of the eclipsed Moon is created by sunlight first passing through the Earth's atmosphere, which preferentially scatters blue light (making the sky blue) but passes and refracts red light, before reflecting back off the Moon. Differing amounts of clouds and volcanic dust in the Earth's atmosphere make each lunar eclipse appear differently. Gamma-ray bursts rule the high-energy sky and Saturday another brief, intense flash of gamma-rays from the cosmos triggered space-based detectors. The orbiting Compton Observatory's BATSE instrument quickly relayed the burst's approximate location to fast-slewing, ground-based cameras primed to search for an elusive optical flash. 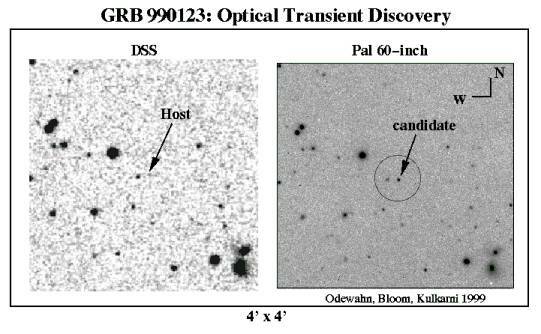 The result -- the GCN coordinated ROTSE-I telephoto array recorded a breakthrough detection only 22 seconds after the burst trigger. Larger telescopes too captured the burster's optical counterpart and at right is an image identifying the candidate from the 60 inch Palomar reflector. At left is a prior sky survey image of the region which astonishingly shows a discernible smudge near the same position, likely the burster's host galaxy. The galaxy and bright burst suggest that this is the closest yet localized gamma-ray burst! Still, believed to be the most powerful explosions in the Universe, the source of the incredible energy of gamma-ray bursts remains a mystery. Update: Reported redshift measurements now suggest that the burst is instead a very distant one. The galaxy in the survey image may not be the gamma-ray burst host but a foreground galaxy which by chance lies along the line of sight from Earth to the burster. Almost unknown to casual observers in the northern hemisphere, the southern sky contains two diffuse wonders known as the Magellanic Clouds. The Magellanic Clouds are small irregular galaxies orbiting our own larger Milky Way spiral galaxy. 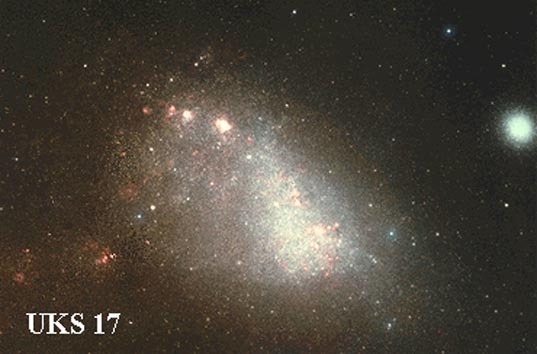 The Small Magellanic Cloud (SMC), pictured here, is about 250,000 light years away and contains a preponderance of young, hot, blue stars indicating it has undergone a recent period of star formation. There is evidence that the SMC is not gravitationally bound to the LMC. The Whirlpool Galaxy is a classic spiral galaxy. At only 15 million light years distant, M51, also cataloged as NGC 5194, is one of the brighter and more picturesque galaxies on the sky. The smaller galaxy appearing here above and to the right is also well behind M51, as can be inferred by the dust in M51's spiral arm blocking light from this smaller galaxy. Astronomers speculate that M51's spiral structure is primarily due to it's gravitational interaction with this smaller galaxy. This carrot shaped track is actually little more than 5 hundredths of an inch long. It is the trail of a meteroid through a gel exposed to space in low earth orbit by the shuttle launched EURECA (European Recoverable Carrier) spacecraft. The meteoroid itself, about a thousandth of an inch in diameter, is visible where it came to rest, just beyond the tip of the carrot (far right). Chemical analyses of interplanetary dust particles similar to this one suggest that some of them may be bits of comets and represent samples of material from the early stages of the formation of the Solar System. NASA's Stardust mission, planned for launch in 1999, will attempt to directly collect dust from the tail of a comet and return it to Earth.